On September 28, Ambassador Liu Xiaoming met with Victor Chu, Co-Chairman of the International Business Council of the World Economic Forum and Chairman of Hong Kong First Eastern Investment Group. 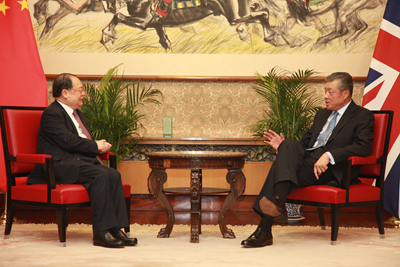 Ambassador Liu noted that China had maintained sound cooperation with World Economic Forum. Earlier this year, President Xi Jinping attended the Annual Meeting of the Forum and delivered a speech, which shows that the President attached great importance to the Forum. Despite of recent improvement in the world economy, risks and challenges could not be ignored. China's economy has been developing steadily and will continue to serve as a "stable anchor" of the world economy. He was convinced that as a bridge between China and Britain, Hong Kong would have a more promising future with the strong support of the central government and the sustained efforts from the new SAR government. Victor Chu said that the speech of President Xi Jinping delivered at the Annual Meeting of World Economic Forum was very impressive and inspiring, which was highly valued by all parties. Its positive effects have remained strong. The Forum treasures the long-term friendly cooperation with China and hopes to have China's continuous support. He would work together with other patriotic Hong Kong entrepreneurs to continue to actively participate in the construction of Hong Kong in the new era and in supporting the SAR government to promote Hong Kong's prosperity and stability.